Willow Tree is an intimate line of figurative sculptures that speak in quiet ways to heal, comfort, protect and inspire. Artist Susan Lordi hand carves the original of each figure from her studio in Kansas City Missouri. We offer cake toppers, angels and figures of flowers, animals and much more which represents an emotion or it marks a memory. Every Mother’s Day, you get the opportunity to tell the special mom in your life how important she is to you. You can say it to her through words, and you can show her through a gift as well. Finding her a distinctive gift—something special to warm her heart—is a thoughtful way to show her what a great mom she is. To help you come up with ways to express your love, here are a few gift ideas for celebrating mom on May 12. If your mom doesn’t have a distinctive, special memory box, she probably would love to receive one. It’s a specific place for her to store sentimental items that she wants to keep but not necessarily display. With a memory box, she could safely store items she doesn’t want to lose or throw away, items like tickets to special events, photos, jewelry, cards from special occasions, letters, and other important mementos. A finely crafted wooden box with a carving on the front is a beautiful celebration of the relationship between mother and daughter. Fill the room with the sound of delicate and soft music. A hand-painted musical figure that turns gracefully to the sound of music playing is a special gift for mom that she’d certainly appreciate. Musical figures make meaningful gifts for Mother’s Day or on a special day to recognize godparents or commemorate a baptism. Consider gifting one to your mother and perhaps even using another as a thoughtful sister gifts option so you all think of each other when you pass yours by or enjoy its sweet music. Give a gift that truly speaks to your mother with a figurative sculpture that focuses on gestures and form, a piece that both the giver and receiver understand. Willow Tree® figurines by artist Susan Lordi are perfect expressions of love and the special relationships we share. Her mother and child figures, for instance, serve as important reminders of milestones in every mom’s life. There’s sure to be a piece that speaks to you personally among Lordi’s intimate line of hand-painted sculptures. Your mom will treasure Lordi’s sculptural artwork forever. Truly memorable ornaments make perfect gifts to celebrate all sorts of special occasions and life milestones. When hung on a tree, an angel ornament in prayer can be a metaphor for peace, beauty, and love. Or, it can symbolize anything inspirational in your mother’s life and adorn a space on the wall year-round. Choose a figurative ornament that you’re sure will hold meaning for both of you, maybe one with a heartfelt message written on the back as well. She will always be reminded of Mother’s Day when she looks at her ornament from you. Willow Tree® offers the quiet beauty of artist Susan Lordi’s intimate line of figurative sculptures. Her Willow Tree® sculptural figures tenderly express love, closeness, healing, courage, and hope—all the emotions of a life well-lived. Lordi has designed and created Willow Tree® sculptures for the past 20 years in her studio in Kansas City, Missouri. 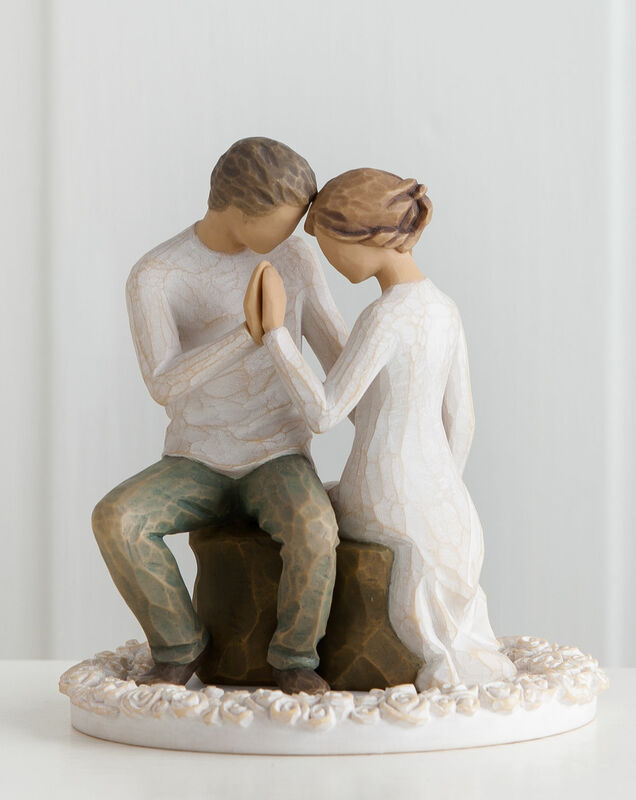 You can find a variety of sculptural figures and artful products, including wedding presents, religious gifts, housewarming items, thoughtful memorial gifts, and much more from Willow Tree®. Having to rush out and buy a gift at the last minute is a pretty stressful situation to be in. So, instead of being caught off guard or procrastinating, wouldn’t it be nice to have some really special gifts on hand? By shopping ahead you’ll have time to carefully pick out thoughtfully curated gifts for some of the most important people in your life. Here are a few ideas for varying people and life events. Is there an important anniversary coming up soon? Regardless of if it’s next week or not, the anniversary will happen at some point this year, and thinking ahead and purchasing a memorable gift is a welcomed idea. An artistically-crafted cake topper for the anniversary cake or even for a celebration piece to stand on its own is a thoughtful gift. 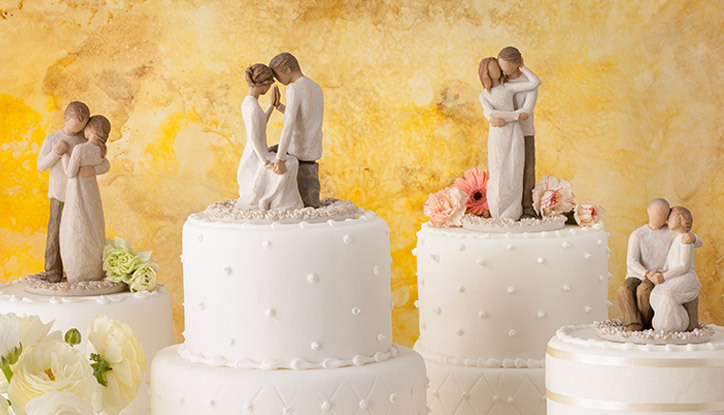 Be sure to browse cake toppers crafted by a talented artist to find one that truly and authentically represents their love. Grandmothers are special ladies and deserve an extra bit of thoughtfulness. So, make sure you have plenty of time to purchase her a birthday or Christmas gift in advance of the occasion—especially if she’s challenging to shop for. It would warm her heart to receive a hand-painted figure that symbolizes your relationship with her and thoughtfully conveys what it means to you. Gifts for grandma don’t need to be tough to choose with the help of companies who specialize in heartfelt art. Some friendships truly are priceless, so what better way to say how much someone means to you than with a thoughtful piece of art that displays appreciation, kindness, and joy—to name a few. A sweet friendship plaque that’s hand-painted and could be hung on the wall or displayed on a stand is a perfect gift to celebrate supportive friendships among women. Thoughtful best friend gifts could also include resin figures of two women sharing a moment or one figure that reminds you of her, someone who lifts your spirits and enriches your life every day. While you can’t always predict when someone is going to pass away, it wouldn’t hurt to choose a gift in advance when those close to you are dealing with a sick or dying parent, or even a pet. Having thoughtful sympathy gifts on hand is always a wise idea as it will be an appreciated gesture that can convey your love and support to those experiencing loss. Finely-crafted angel ornaments and figures, comfort plaques, or musicals that play songs such as “Amazing Grace” are all meaningful gift ideas. When you’re prepared for inevitable life events or are simply wanting to celebrate someone, you can focus on giving your attention to the person who needs you and means a lot to you. Start making your thoughtful gift list today. For more than 20 years, Willow Tree® has offered intimate handcrafted art pieces by well-known artist Susan Lordi, who creates the original carvings at her studio in Kansas City, Missouri. Lordi’s distinct style is revealed through gestures only, such as a warm embrace, a tilt of the head, her placement of the hands, or a turn of the body. Everything Lordi makes, from thoughtful figures to plaques and ornaments, are meant to inspire both the giver and the receiver. Willow Tree® art pieces also speak in quiet ways to comfort and uplift. You have to admit it’s nice to get a gift out of the blue. It means someone cares about your well-being and is thinking of you. So, why not honor your relationship with some of your favorite people this spring with thoughtful “just because” gifts? Springtime marks a period of change, growth, renewal, and, hopefully, lots of sunshine on the horizon. Celebrate Mother Nature and extend your gratitude to someone special to you—whether you’re looking for sister gifts or best friend gifts—with these cheerful ideas. Beautiful, blooming flowers can be given at any time of the year as a gesture of friendship or love. Spring is an especially appropriate time of year because annuals are starting to shoot up from the ground and perennials are ready to go into the ground. Each flower even has a different meaning associated with it. An iris, for example, is linked to wisdom and trust while a lily symbolizes purity and refined beauty. You could gather a bouquet and gift it to a family member or friend who means a lot to you and who you don’t see as much as you’d like. The only downside is that flowers wilt and fade away, so instead, consider giving a gift that “blooms” year-round. This could be a hand-painted resin figure of a woman holding a pretty bouquet like those found on Willow Tree® by artist Susan Lordi. There are a variety of sculptural figures to choose from, and they also make thoughtful grandma gifts or gifts for those who simply love flowers. Everyone needs an elegant journal at their fingertips to write down their feelings or to draw, craft poems, or jot down daily tasks. You could choose a beautiful journal with inlaid carvings on the cover or one that looks like an old classic book with the look of aged leather. A journal is a treasure, something that’s meaningful to both the giver and receiver. Putting pen to paper is also therapeutic. You don’t have to worry about anything but getting your thoughts and ideas down. It’s a very personal, special experience. Journaling is also a good way to help you remember what you were doing and who you were with at various points in your life. Someday, as you flip through previous pages, it will be like taking a step back in time or a trip down memory lane. One can also write down what they’re grateful for daily to regularly count their blessings. A triptych tells a story in three parts. It is a picture, painting, or carving that’s divided into three sections that are hinged together and can be folded shut or displayed open. The middle panel is typically the largest and is flanked by two smaller works that are related to the middle piece. A triptych can tell a dramatic or compelling story because each piece relates to the others in some way. They can stand on display or be hung on the wall open or closed. In addition to being a great “just because” present, a romantic triptych would also make a great wedding, anniversary, or birthday gift for your partner. A “just because” gift works wonders to brighten someone’s day or put a little extra spring in their step this season. When searching for the prefect present, consider the person, what you love about them, and what gifts would help truly convey your feelings and honor your special relationship. For more than 20 years, Willow Tree® has offered intimate handcrafted figures by well-known artist Susan Lordi, who creates the original carvings at her studio in Kansas City, Missouri. Lordi’s distinct style is revealed through gestures only, such as a warm embrace, a tilt of the head, her placement of the hands, or a turn of the body. Everything Lordi makes, from thoughtful figures to plaques and ornaments, are meant to inspire both the giver and the receiver. Willow Tree® art pieces also speak in quiet ways to comfort and uplift. There’s nothing quite like the love you get from a pet. They love us unconditionally. They know intuitively how to make us feel better and they teach us how to be a good friend. The animal-human bond is special indeed. Kids especially love their pets. Sometimes a child’s cat or dog is their first best friend, and the one creature they can go to as a source of support. A wonderful present for children would be sculptures or figurines that depict a girl or boy holding their beloved pet in their arms. A handcrafted Willow Tree® figure by artist Susan Lordi would be sure to delight a special child in your life and represent the loving and kind relationship the two share. Kids like to decorate their rooms with mementos and items they care about. A hand-painted resin figure or even a plaque of a child hugging their pet would look great on their desk, bookshelf, or nightstand—somewhere they can see it every day. Losing a beloved pet companion is never easy to go through. Our pets become more than pets to us, so it’s like losing a family member for many people when their animal passes. Thoughtful memorial gifts for someone who’s grieving can come in many forms, whether it’s through a poem, sympathy card, a pet keepsake box, memory box, or a comfort plaque of a child hugging a dog. Give someone dealing with the loss of their pet something to console them in their time of grief and honor the relationship they shared. After all, sometimes a gift or thoughtful keepsake is the best way to convey your feelings when the right words are hard to find. True horse lovers would be delighted to receive a gift that acknowledges their passion for all things equine. Giving a friend or family member something that has meaning and love behind it is much better than any gift card. A thoughtful gift could come in the form of a finely crafted, hand-painted memory box adorned with a horse. In addition to being a great “just because” gift, it would also make the perfect present for Mother’s Day or a birthday. Horses symbolize strength and protection to many. Keepsake or memory boxes for horse owners to place a strand of horse hair in or other mementos can also make for touching bereavement gifts. No matter the occasion, pet gifts that come from the heart are always a good choice. Our pets are our constant companions, friends, and playmates. Honor them and the recipient of your gift today. We all need a soft place to fall—a place to feel safe and comforted and a place to get sympathy and support. Families provide this environment. They let us be who we are and love us unconditionally. Relationships are what life is all about, so to honor those special bonds we often show appreciation by giving tokens of our love. One meaningful way to convey love is through gift-giving. The following ideas will help you decide how to choose a thoughtful gift to honor the relationship you share with various members of your family. If you have sisters or brothers, you’ve likely shared a considerable amount of time together growing up and have developed a level of closeness that is unlike any other relationship in your life. Siblings offer a support system in good times and in bad. They are there to make you laugh like no other and they give your life more richness and enjoyment through the years. The best brother or sister gifts come in many forms, but you can tell when a gift truly comes from the heart. 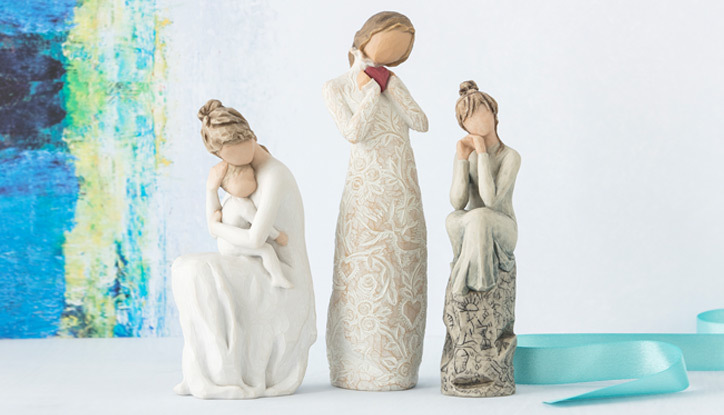 Touching brother or sister gifts can come in the form of sculpted figures that show your enduring bond, such as artist Susan Lordi’s thoughtful Willow Tree® pieces. Whether you gift artful figures of two sisters standing side by side, a hand-painted wall plaque, or a keepsake box for treasures, there are plenty of ways to express your love and care. In addition, it’s always a nice gesture to send your sibling a handwritten message in a colorful notecard. The love between a grandparent and grandchild is a unique one. A grandparent has the patience required, and the wisdom earned, to pass along knowledge to younger generations. The patriarchs of the family deserve your respect—and a gift that shows such. Your gift can be as simple as a poem you wrote especially for them or as elaborate as a handmade project that took you months to create. A thoughtful gift could bea touching figure that shows the bond between grandparents and grandchildren—perfect grandpa or grandma gifts. Grandparents are often considered angels watching over our shoulders, so a lovely angel ornament or figure would be well-received. Sometimes we take our significant others for granted, but with a gentle reminder to ourselves, we can honor our commitment with a thoughtful gift. The relationship with your spouse is a sacred one, so it’s easy to remember why you fell in love in the first place and pay respect to where you’re currently at in your lives together. Whether you’re expecting a baby together or have recently had one, a joyful gift of new life is a welcome addition to any family. Artwork or figures that represent this chapter are a great way to commemorate it. And sometimes couples just want to celebrate their love together with a romantic sculpture of their close relationship—this can be a lovely gift to honor your bond as well. Since 1999, Willow Tree® has offered empowering and inspirational gifts to people across the world. The Willow Tree® collection of intimate and empowering figurative sculptures are based on handcrafted works from artist Susan Lordi in her Kansas City, Missouri studio. The Willow Tree® figures are distinctive in that they are faceless, with the small details in the poses of the figures telling the story and depicting the emotional weight of the sculpture. Willow Tree® also offers other items like keepsake boxes, ornaments, plaques, and more. They serve as memorable gifts for any occasion whether you need memorial gifts, wedding gifts, birthday gifts, or more. On Friday, March 8, the world will come together to celebrate International Women’s Day, a holiday dedicated to celebrating the social, cultural, economic, and political achievements of women. It's also a day to celebrate the most important women in your life and thank them for all of their support and friendship over the years. Although a dedicated holiday, even once International Women’s Day has passed, celebrating the contributions that women have made in your life should be a year-round event. If you can't decide what to get these impactful women, here are a few gift ideas bound to put a smile on their face and make them feel appreciated. Our friends, although not blood related, are some of the most important people in our lives. They’re the family members that we choose and are always by our side to lend a helping hand. Some of the best friend gifts are small things that serve as valuable treasures representing your friendship. This International Women’s Day show your best gal pals how much they mean to you with a unique keepsake box depicting your friendship, full of personal mementos. Whatever you decide to put in the box is up to you, but this simple yet powerful gift will warm their heart for sure. Your mother is one of the few women who have been there for you every step of the way. From reading bedtime stories to you when you were younger and helping you with homework to cooking dinner and even cosigning your first apartment, it’s hard for many people to name a woman more impactful and important in their life than their mom. For all the love and support that she’s given you, you’re probably always looking for another day or reason to shower her with love and gifts, so make International Women’s Day that opportunity. One unique gift that will show the strength of your relationship is a pair of sculptural figures depicting a mother and child. You can find different versions available with figures in various poses and with distinctive characteristics. Shop around and find one or two that embody the loving bond you share and she’ll proudly display them for others to see. Similar to your mom, your grandma has been there your entire life and would likely drop everything at a moment’s notice to lend you a hand or fix a batch of cookies if you so wished. While shopping for gifts for grandma, you might feel like she has everything and there isn't much you could get her that would have an emotional impact. Think outside the box and consider getting her a handcrafted ornament or thoughtful wall plaque. Even though the holiday season has come and gone, ornaments are great wall décor, and once it comes time to put up the Christmas tree, she'll lovingly hang her new ornament and think of you. Since 1999, Willow Tree® has offered empowering and inspirational gifts to people across the world. The Willow Tree® collection of intimate and empowering figurative sculptures are based on handcrafted works from artist Susan Lordi in her Kansas City, Missouri studio. The Willow Tree® figures are distinctive in that they are faceless, with the small details in the poses of the figures telling the story and depicting the emotional weight of the sculpture. Willow Tree® also offers other items like keepsake boxes, ornaments, plaques, and more. They serve as memorable gifts for any occasion whether you need sympathy gifts, wedding gifts, birthday gifts, or more. Buying a first or new home is always an exciting time, and with friends moving into a new place that can only mean one thing—housewarming party! You can't show up empty-handed, so why not help the new homeowners decorate their new space with these housewarming party-approved art gifts. Sometimes the things that are most valuable to us are items that have no monetary value at all. Photographs, notes, and more may be among keepsakes that we’ve come to cherish over the years. To help new homeowners store precious items together and in one place, a keepsake box or memory box can serve as a fantastic gift. You can find many different styles of memory boxes and keepsake boxes, but among the most memorable are those made of wood or resin that feature artistic carvings of thoughtful figures on the lid. Whichever box you choose, it’s sure to sit on their shelf or mantel proudly holding the things that matter to them most. Moving into a new home often signals the turning of a page and the start of a new chapter for the happy homeowners. To celebrate these new beginnings, help them add some décor to their new home. You should look for art pieces that celebrate these new beginnings and provide hopeful inspiration every time they pass by. Sculptural figurines are great gifts because they often depict people either on their own or with companions in a variety of different loving, supportive poses. Seek outa figure to gift as a standalone piece to display on a mantel or shelf, or opt for one on a stand that plays music. You could also help commemorate the move with a 2019 ornament or another artful figure they could hang on their Christmas tree or wall. Although we live in the digital age, there is simply nothing like the sight of books lining bookshelves or placed upon a coffee table. Even if hectic schedules prevent your new homeowner friends from reading as much as they would like, books can still function as art pieces. In fact, some products might look like books but are there just as a way to add some color to their shelves or serve as backgrounds for their sculptural figures while offering functional storage for memorable items. For some authentic style, look for a faux volume influenced by the Golden Age of early 20th century book design. With the start of a new chapter, it's important to look back on the people who are no longer with us through touching memorial gifts. Whether a friend, loved one, or pet, remembering the people and animals that touched our lives is essential for moving forward, and the right gift can provide comfort and hope when needed most. Remembrance gifts can help provide support, sympathy, and remembrance. Thoughtful memorial gifts may come in the form of a hand-painted figure of an angel, a touching plaque, or ornament. Gift one to honor and remember those no longer with us and to bless a new home. Since 1999, Willow Tree® has offered empowering and inspirational gifts to people across the world. The Willow Tree® collection of intimate and empowering figurative sculptures are based on handcrafted works from artist Susan Lordi in her Kansas City, Missouri studio. The Willow Tree® figures are distinctive in that they are faceless, with the small details in the poses of the figures telling the story and depicting the emotional weight of the sculpture. Willow Tree® also offers other items like keepsake boxes, ornaments, plaques, and more. They serve as memorable gifts for any occasion whether you need bereavement gifts, wedding gifts, birthday gifts, or more. Valentine’s Day is only a few weeks away, and even though the shopping frenzy of the holiday season is behind us, buying gifts for your Valentine can be just as gratifying. Whether your Valentine is a significant other or someone else you’re close to, buying someone like your sister gifts on Valentine’s Day is sure to light up their smile. Finding the perfect Valentine’s Day gift can be a challenge for some people, but if you want to mix it up this year and give a gift more unique than the standard flowers and chocolates, here are a few tips and ideas to help. For men especially, it’s easy to get caught up in the practicality loop. Sure, your Valentine might be in need of a new hairdryer, but chances are she’d rather buy one for herself than get one with a pink bow around it. Think about getting something that will really impress her and show that you took the time to think about what she truly loves. The same goes for people who buy repeat gifts too. If you find yourself brushing off Valentine’s Day gift-giving as just going through the motions and buying her “the usual,” then this is the year to mix it up. She’ll be excited to see that you’ve gone above and beyond to find new gifts instead of the same roses and chocolates. Sometimes the best gifts that we receive feature a message that can’t be captured in words alone. For example, sculptural figures are great gifts for any occasion and will warm hearts—especially on Valentine’s Day. Figures from Willow Tree®, for example, depict one, two, or more people in thoughtful poses. These expressionless figures speak through their gestures and serve as a blank slate for your loved one to project their thoughts and feelings about you. They’re also great, hand-painted pieces to add to any interior décor. Willow Tree® figures are perfect gifts for friends, family, and partners. Shop around to find the perfect symbolic gift for your Valentine to represent your feelings toward them and relationship with them. We all need a little bit of help from time to time. If you feel like you’re stuck and can’t think of any gift ideas for your Valentine, don’t hesitate to reach out to their friends or family for ideas. Even if you know a person really well, finding the perfect gift can still feel overwhelming. Getting an outside perspective from people who know your Valentine equally well—if not more than you—will spark your inspiration and is bound to help you come up with some new gift ideas. When all is said and done, Valentine's Day is just one day out of the year, and if the relationship continues growing, you’ll have plenty more opportunities to gift again. Don’t overthink your present and don’t spend three paychecks for a box of gold-plated truffles either. Keep it simple and remember that it’s the thought that really matters in the end. If you buy a gift from the heart, they’re practically guaranteed to love it. Willow Tree® is known for offering hand-sculpted art pieces from renowned artist Susan Lordi. She has designed and created Willow Tree® sculptures since 1999 and handcrafts the pieces in her studio in Kansas City, Missouri. Her unique style emphasizes the details found in the body language of the figures. They are expressionless, meaning that the emotion conveyed in each piece is purely through small physical features. Willow Tree® offers a variety of artful products and sculptural figures, including wedding presents, grandma gifts, housewarming gifts, and more. Giving a gift to someone you love can be one of the most gratifying feelings for many people. Though some will associate the winter holidays as the exclusive gift-giving time of the year, gift-giving enthusiasts know that any time of year—holiday or not—is the perfect time to give a gift. So, if you’re looking for something to give a friend or loved one “just because,” here are a few great ideas that are sure to impress. Buying your best friend gifts can be one of the most rewarding feelings. A great gift to give them during any time of the year is a cute keepsake box. Part of what makes a handcrafted keepsake box such a great gift is that you can store anything in them.Whether they need something to store their jewelry in or you fill the box with small mementos of your friendship, a thoughtful keepsake box is sure to be a treasured gift for any close friend. Sculptural figures are a great way to express your love and appreciation for friends or family. Willow Tree®, for example,offers an extensive selection of sculptural figures in a variety of collections for different occasions. As you shop for a thoughtful figure, you should choose one that is created from an artist’s original work and hand-painted. This way, every piece will perfectly capture the tiny details of the artist’s original work for an authentic touch. Look for a figure that depicts the special relationship you share and expresses powerful emotions through gestures for a gift they’ll cherish forever. Buying gifts for grandma brings joy to many people, but finding the perfect gift can always feel like a challenge since it seems like she practically has everything already. One gift that’s always a surefire bet is a hand-painted ornament. Not only do ornaments look good when hung from a Christmas tree, but they can also be great wall decorations for the entire year. She can never have too many ornaments, and if you get her an extra-special one based on the handcrafted work of a renowned artist, she'll be proud to display it year-round. Do you know someone who is getting married this year? Or a couple about to celebrate a big anniversary? Whatever the case may be, artistically-crafted cake toppers are perfect for such occasions.Beyond the celebration, a cake topper looks great sitting on a shelf or mantel for all to see for years to come. Many great decorative cake topper pieces will stand on their own just fine and some of the best feature figures of two lovers locked in an eternal embrace. Give the gift of love no matter what time of year it is with a handcrafted cake topper. Willow Tree® is known for offering hand-sculpted art pieces from renowned artist Susan Lordi. She has designed and created Willow Tree® sculptures since 1999 and handcrafts the pieces in her studio in Kansas City, Missouri. Her unique style emphasizes the details found in the body language of the figures. They are expressionless, meaning that the emotion conveyed in each piece is purely through small physical features. Willow Tree® offers a variety of artful products and sculptural figures, including wedding presents, sympathy gifts, housewarming gifts, and more. The holidays have come and gone, and with 2019 just beginning, we’re looking forward to the joy and experiences that this new year will bring. Many of us like to make New Year's resolutions to set goals for the year while others will head into 2019 with the plan to just keep doing what they're doing. Whichever camp you’re in, a great way to celebrate the start of 2019 is to buy gifts for family, friends, or yourself to serve as a memento to remember for years to come. Here are a few thoughtful gift ideas to help celebrate and commemorate this new year. Sculptural figurines are not only great gifts but can also light up a room as an essential piece of your interior décor. You can find a variety of different figures for any occasion from Willow Tree®. 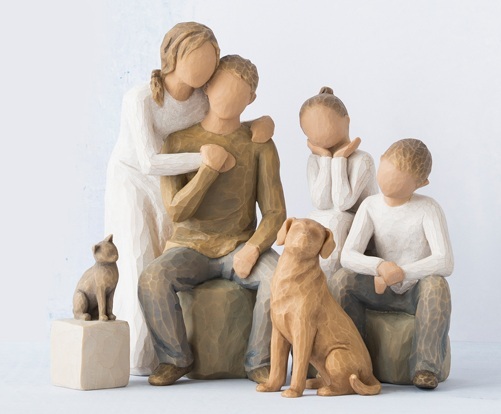 Whether you want a commemorative sculpture to give to a friend, showing your bond with them, or you know a newly-married couple who would adore a sculpture depicting their commitment and love for one another, you can find an expansive collection of thoughtful, handcrafted figures from Willow Tree®. Look for figures that are unique in their own way, speaking through gestures and subtle motions, and they'll serve as a reminder throughout the year of the special relationships loved ones share. As the year moves on, you’ll find there are plenty of moments that you’d like to write down to commemorate them. Even better, you can share these moments with friends via a thoughtful, handwritten card. Specialty notecards are also a great purchase if you haven’t gotten around to writing “thank you” cards expressing your gratitude for gifts and time shared over the holidays. When selecting a notecard, look for a well-made card with a beautiful, artistic design to complement your message. Getting the notecards in a set will help make it so you always have one on hand. Celebrate the opportunities and hope this new year holds by sending handwritten messages to family and friends. Along with traditional sculpted figures, you can also find others that will fill a room with the sound of soft and delicate music. 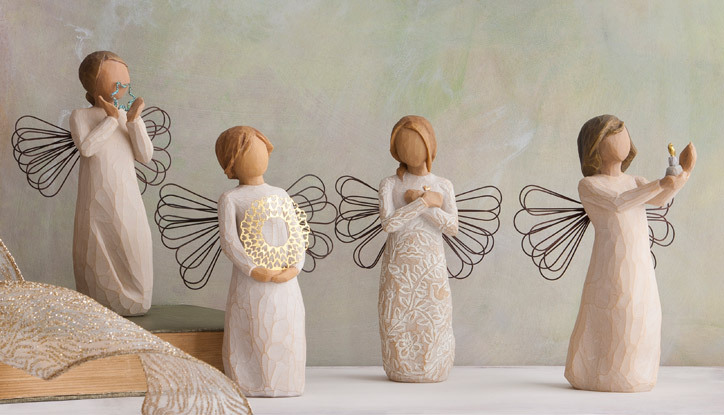 In addition to their figures that stand graceful and still, Willow Tree® also offers these hand-carved works of art set upon simple bases that turn move gracefully to the sound of music. Keep the music flowing in 2019 and use these pieces as a way to slow life down and relax. Seek out a musical figure that speaks to you or beautifully represents the relationship you share with a loved one, be it through a figure featuring an angel, child, friend, or couple in a warm embrace. As we start the new year, it’s a sad reality that you or someone you know might have lost someone in the past year, and heading into 2019 without them can be difficult. Memorial gifts can serve as symbolic reminders of those we’ve lost; and when gifted, represent our loving, caring support. Sculptural figures conveying messages of sympathy and remembrance can come in different sizes and forms, but each one is full of soft and gentle love. Willow Tree® is known for offering hand-sculpted art pieces from renowned artist Susan Lordi. She has designed and created Willow Tree® sculptures since 1999 and handcrafts the pieces in her studio in Kansas City, Missouri. Her unique style emphasizes the details found in the body language of the figures. They are expressionless, meaning that the emotion conveyed in each piece is purely through small physical features. Willow Tree® offers a variety of artful products and sculptural figures, including wedding presents, bereavement gifts, housewarming gifts, and more. As the holidays fast approach and you’re hosting a holiday get-together, you want to make sure that your dining room looks perfect. Hosting a holiday dinner can be a lot more pressure than what it first seemed like when you volunteered. Not only does the food need to be top-notch, but the dining environment should also be dressed to impress. If you're not sure where to start, but want to impress your holiday guests, here are a few tips to help inspire the perfect décor for your holiday dinner. Consider them as you’re decorating your home with the box of holiday items you’ve collected over the years and other mementos that warm your heart, such as best friend gifts. One of the most noticeable trends in décor is to incorporate some natural elements that will make your holiday dinner feel less stuffy and more down to earth. A simple and quick way to add some natural features is to use pine tree branches as table arrangements mixed in with some flowers. You can also try your hand at making authentic wreathes using pine tree branches or any other plants that grow in your area. A nativity set is a holiday classic, and you can place it anywhere in your home that you think would fit well. With so many different types of nativity sets available, you can pick and choose elements like backdrops and sculptural figures to match the aesthetic of your home décor. You can set it up on your dining room table as a centerpiece or you can place it on a countertop or table for your guests to look at and observe all night long. Beautiful, hand-carved ornaments make great gifts for grandma or decoration for the tree. They can also function as art for the dining room if you have the right kind and hang them strategically. In many cases, flat ornaments can hang cleanly on the wall, and if you have any sort of hanging light fixture like a chandelier, you can hang ornaments from that for some extra holiday flair above the table. With the holidays you have many more color options than you might initially assume. While red is most likely the dominant color for your décor, you can also create a wonderfully festive theme using different shades of gold, white, green, and even orange. It really depends on how you want your dining room to come off. Do you want it to be elegant? Then consider decorating with gold and white. Classic? Red, green, and white might be optimal. Or would you welcome a more unique twist on holiday colors? In that case, experiment and maybe try out a reddish-orange shade or a color you haven’t considered before. Whatever the case may be, experiment and coordinate your colors accordingly for one cohesive aesthetic. For more than 20 years, Willow Tree® has provided people with hand-sculpted art pieces detailing the delicate and beautiful language of the body. Created in her studio in Kansas City, Missouri, artist Susan Lordi hand carves each piece with love and care with special attention paid to the small details they show in their body language. The figures are expressionless, which makes every tilt of the head and placement of the hands crucial to expressing the perfect emotion. They make great holiday gifts but can suit any occasion as thoughtful wedding presents, sympathy gifts, and more. What Do You Gift Your Grandma, the Woman Who Has Everything? Your grandma is likely one of the most inspirational and impactful figures in your life. As such, every year you want to find new ways to show your appreciation for everything she’s done for you. Even though you have known her for years and have spent many holidays with her, finding the best gift for your grandma might feel like an annual challenge rather than a fun shopping experience. The most significant reason that buying grandma gifts can feel like a challenge is because it seems like she has everything! She's spent more time on this earth than you have and has a head start on you when it comes to collecting things. She’s often covered in the practical gifts category. She has a million and one books in her library, and the last thing she needs is a tech gadget that will just add more clutter to her life. Fortunately, over the years you’ve come to know your grandma and your special relationship better than anyone else. So tap into that knowledge and utilize the unique ideas below for thoughtful gifts and gestures she’s practically guaranteed to love! Do you know the three words that will send any grandmother into emergency mode? You can probably relate and remember all of the times when grandma would drop everything to make you a meal while you were growing up (and likely after that as well). Though she might never ask you to, it’s likely she’d love if you’d repay the favor by cooking a meal from scratch for her.Plan out a date, invite her over for dinner, and pull out all of the stops. Make it a dinner that she'll remember, and she’ll love it more than any gift card you could have given her. When you were young, your grandma probably told you stories about her youth, your family, and more. But now that you’re grown up and have a busy career, you don’t quite have the time to sit with her and listen to her stories like you used to. Well this year, along with any other gift you get her, show your appreciation for your grandmother by asking about her childhood memories and spending some quality time together. The holiday season is perfect for this since you’ll have a few extra days off work and can schedule in time for family. While your grandma seems to have most everything, one thing that she might not have that she’ll keep and display forever is a sculptural figure showing your love and appreciation for her. These handcrafted figures are perfect to display on a coffee table, bookshelf, mantel, or anywhere else, because while they take up little physical space, they are big enough symbolically to fill your grandmother's heart. Seek out one that perfectly showcases the symbolic nature of your relationship with each other for a gift she’s sure to cherish. 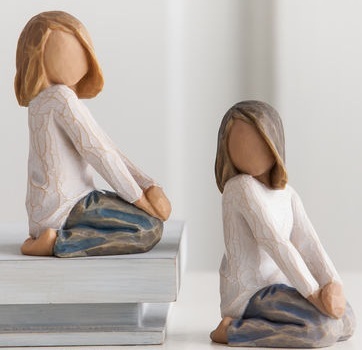 It doesn’t matter if you’re buying your grandma or your sister gifts, Willow Tree® provides beautiful, hand-carved sculptural figures for any recipient or occasion. 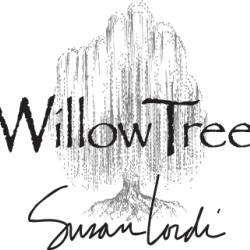 The Willow Tree® story began in 1999 when artist Susan Lordi started making these figures in her studio in Kansas City, Missouri. Since then, Willow Tree® has provided people across the world with handcrafted gifts and mementos full of life and love. As the holiday season approaches, you’re probably excited for the opportunity to see and spend time with your family. Whether you live across the country and only see them once or twice a year, or you live right down the block, spending time with your loved ones is the best part of the season. Sadly, some family members have passed on, and their seat at the dinner table will never be completely filled again, but there are still ways that you can keep their memory alive during your holiday family gatherings. Let’s take a look at some of the best ways to remember your loved ones this holiday season. What did they enjoy eating the most? Maybe it was your Aunt Vivian’s green bean casserole, or perhaps they had the best recipe for dinner rolls from scratch. Whatever the case may be, research shows that the taste of foods is a powerful way to reconnect with your memories. Also, if you have access to their recipe book, you can keep their signature dish alive for generations by recreating it every year, honoring the tradition of passing down family recipes. So, this holiday season, enjoy a dish that reminds you of your lost loved ones and keep their memory alive at the family gathering. What do you remember most about your lost loved one? Was it how they were always there for your little league games growing up? What about that time they came dressed as Santa Claus and handed out gifts at a holiday gathering years ago? The best way to keep your loved one's memory alive is to continue talking about them with your friends and family. Don't be afraid to share these memories with the people at your holiday gathering while you're busy catching up with them—they likely have memories of their own to share as well. When a loved one passed away, you might have given or received touching memorial gifts to honor their memory. These gifts are incredibly helpful and can aid people going through the grieving process. They’re also useful years afterward when one wants to look back and remember the good times that they had with that person. If you still have these memorial bereavement gifts, you should put them on full display at the holiday party. Place them on a coffee table, fireplace mantel, or anywhere else you feel it would be fitting for the festivities. Since 1999, artist Susan Lordi has been designing and hand-carving inspirational gifts that put the silent beauty of body language on full display. Her pieces, carved in her studio in Kansas City, Missouri, contain no facial expressions, meaning that every detail of the body, from the head placement to the position of the hands and feet, showcase the distinctive and delicate features that we all have. With Willow Tree® handmade sculptural figurines, you can project the characteristics you loved the most about your passed loved ones and cherish them for years to come. Every year on March 8, we get the chance to honor the inspirational women in our lives. International Women’s Day is about recognizing women who have lived life with purpose, empathy, and vision, and work to effect change in the world around them. International Women’s Day started in 1911 and has since been celebrated across the country. Last year, more than100 groups participated in the official 2018 campaign to showcase their work and achievements in accelerating gender equality in their communities. Outside of the official day of celebration, the group continues to work for and celebrate the social, economic, cultural, and political achievements of women. Although International Women’s Day marks a specific day on the calendar, there are women everywhere who work on behalf of causes they believe every day, to create a more prosperous, equitable community. If there is a woman (or women) in your life that you feel deserves recognition and gratitude, you don’t need to wait until March to show your appreciation. Honor her with a particularly thoughtful gift that captures your appreciative sentiments. If you have a personal message to convey to that powerful woman in your life, whether it be “I miss you,” “I love you,” or “I’m thankful for you,” artistic figures can be a powerful way to communicate that sentiment. Sculptural figures can celebrate the supportive, inspiring, and nurturing relationship between friends, sisters, coworkers, mothers, and daughters. Look for a figure that expresses whatever connection you share with a powerful female in your life, honoring the relationship you share with your mother, child, sibling, friend, neighbor, or colleague. For particularly powerful sister gifts, look for figures that artfully capture sentiments of protection, love, sharing, trust, and joy through colors and body language, such as a tilt of the head. Christmas ornaments are perfect gifts for the inspiring woman in your life. Christmas ornaments come in a variety of designs and sizes and convey different relationships between parents, family, friends, and siblings. For a particularly powerful gift that conveys a personal touch of gratitude and appreciation, look for an ornament with details that remind you of that inspiring woman in your life, such as her favorite flowers or colors. For example, if you are looking for meaningful grandma gifts, select an ornament that you feel captures her presence and power, maybe through a figure that conveys the love and care she has showed you over the years. Another gift to show your gratitude is a thoughtful piece of décor that they can display and always think of you. A small keepsake box adorned with a commemorative image of strength or love is a perfect way to store jewelry or other small items while also conveying appreciation. A decorative book or journal is also a classic, timeless gift that conveys elegance and power. You can purchase a standalone book that they can use to document thoughts, or purchase a set that they can display around the house. However you show your gratitude to the inspirational women in your life, it’s sure to be a gesture that will touch their hearts, be it a sister, grandma, mother, or dear friend. Willow Tree® offers an intimate line of figures and sculptures that softly display love, appreciation, and caring between loved ones. Since 1999, Willow Tree® has inspired uniquely moving gifts that capture life’s sweetest moments. Artist Susan Lordi hand carves each original figure from her studio in Kansas City, Missouri. Each sculptural figure depicts emotion through gestures only, such as the tilt of the head, placement of the hands, or a turn of the body. The simple absence of facial features leaves each figure open for personal interpretation, making them powerful, personal gifts for loved ones. Many of us are familiar with the faith-based narrative behind Christmas. However, fewer of us know the origin of the Christmas gift, and specifically why we exchange gifts on or around December 25th each year. According to The Atlantic, some historians link the act of gifting back to the three wise men in the story of Jesus’s birth while others draw a connection back to the burgeoning upper class in New York City at the turn of the century. Whatever the origins of gift-giving, the act of exchanging presents is now a permanent fixture of the Christmas holiday. If you’re already pondering meaningful gift ideas for those closest to you, follow this gift-giving guide to find a perfect gift for everyone on your list. Whether you’re shopping for a best friend or you consider a member of your family a best friend, certain people play a particularly pivotal role in our lives. Honor these family members or friends with meaningful, thoughtful gifts that capture the love and support you share. Best friend gifts should capture those unique, perhaps humorous, moments you share with someone special. Sculptural figures are powerful ways to convey these sentiments. Look for figures that express the treasured friendship you share with someone, including feelings of trust, understanding, and support. The love between grandparents and grandchildren transcend the years, and a powerful gift can express this timelessness. Look for holiday gifts for grandma and grandpa that can add a meaningful emotional component to the holidays. Christmas ornaments are perfect gifts for grandparents, and they will love displaying them about the house or on the Christmas tree. Christmas ornaments come in a variety of designs and sizes and convey the unique aspects of love and support between generations. Handcrafted figurines conveying the bond you share or a thoughtful keepsake box can also be powerful ways to express your gratitude. The Christmas holiday is all about loving family moments, and nothing captures this unique bond more than a nativity scene that includes Mary, Joseph, and the baby Jesus. Look for sculptural figures that include the expressive gestures of love, protection, and overwhelming emotion between a mother and father and a new baby. 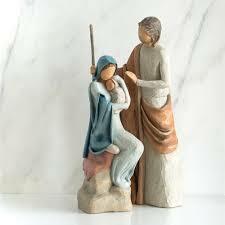 You could also build a tradition each Christmas by expanding the Holy Family nativity scene. Add additional sculptural figures to represent each member of your family or include angelic figures such as a shepherdess and sheep. Willow Tree® offers an intimate line of figures and sculptures that softly display love, appreciation, and trust between loved ones. Since 1999, Willow Tree® has inspired uniquely moving gifts that capture life’s sweetest moments. Artist Susan Lordi hand carves each original figure from her studio in Kansas City, Missouri. Each sculptural figure depicts emotion through gestures only, such as the tilt of the head, placement of the hands, or a turn of the body. The simple absences of facial features leaves each figure open for personal interpretation and make powerful holiday, anniversary, or sympathy gifts for loved ones. Humans have been collecting things for centuries. During the 1700s and 1800s, aristocrats collected world artifacts, including shells, zoological specimens, and works of art and literature, according to The National Psychologist. Wealthy collectors would then display their pieces—often as a way to also showcase wealth—giving rise to what we now know as museums. Although aristocratic collections were largely a sign of status, the art of collecting things remains deeply engrained in our culture today. Now, collecting is less about an ostentatious display of stature and more about psychology. Whether it be fine art, rare coins, figurines, souvenir spoons, photographs, or baseball cards, the art of collecting serves many purposes in our society today. Some of us create and build collections to preserve and honor the past. A collection of antique plates or silverware, family photo albums, an old baseball card collection, or an antique train set can all be passed down from generation to generation and can be a powerful way to preserve a piece of the past. Collections don’t have to be large either. Items that once belonged to grandparents or even great-grandparents are often passed down from generations and evolve into a powerful way to commemorate someone who has passed. Heirlooms such as a piece of jewelry, a watch, a set of cuff links, or even a collection of recipes or beloved sculptural figures often hold significant sentimental value.These collections can also serve as highly personal memorial gifts passed from one generation to the next. In some cases, completing or expanding a collection can be a lifelong passion. People collect commemorative coins or souvenirs from all 50 states while others collect antique teacups. Still, others might collect old-time comic books or unique stamps. Completing a collection can be a labor of love, one that drives many hobbyists. Finishing a rare or antique doll collection, for example, can take years of laborious searching, but the idea of having a complete line can be a powerful motivator. The same can be said for collecting handcrafted figures displaying subtle yet powerful emotions. Some people collect items for the sake of arranging and displaying. A collection can serve as a form of interior decorating, with certain collectors painstakingly arranging antique trains or art throughout the house. Arranging can also be cathartic for some people. For example, some collectors enjoy rearranging a dishware collection depending on the season, and rearranging can be an artistic way to organize their house. Finally, arranging can be commemorative. Displaying a collection of photos, for example, can be a powerful way to remember family vacations or childhood memories. 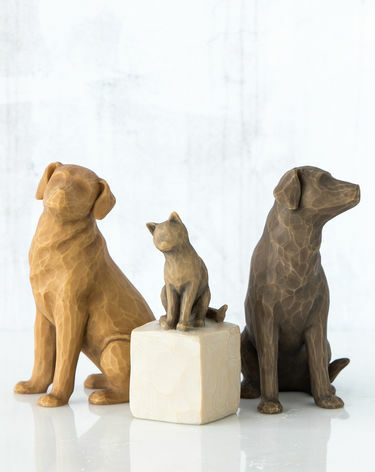 Hand-carved sculptures can also be arranged to display the love between family, friends, and pets. Some collections may find their place on the mantle year-round, while others, such as nativity figurines, tend to make a more prominent appearance during Christmas time. A final reason people might collect is for investment purposes. Higher-end collections like classic cars, vintage furniture, rare books, or first-edition comic books can be very lucrative. People often attend trade shows all over the world to trade or purchase rare pieces, and online marketplaces can sometimes garner hundreds of thousands of dollars for certain rare collectible items. Whatever your reason for collecting, searching for, and displaying items, it can make for a fun pastime or passion. Sculptural figures from Willow Tree® are often collected and displayed with pride by their owners. From nativity sets to figures depicting the love of family and friends, Susan Lordi’s hand-carved line of sculptures are sure to be a nice addition to any collection. Willow Tree® offers an intimate line of figures and sculptures that softly display love, appreciation, and caring between loved ones. Since 1999, Willow Tree® has inspired uniquely moving gifts that capture life’s sweetest moments. Artist Susan Lordi hand carves each original figure from her studio in Kansas City, Missouri. Her sculptural figure depict emotion through gestures only, such as the tilt of the head, placement of the hands, or a turn of the body. The simple absence of facial features leaves each figure open for personal interpretation and make powerful holiday, anniversary, or bereavement gifts for loved ones.